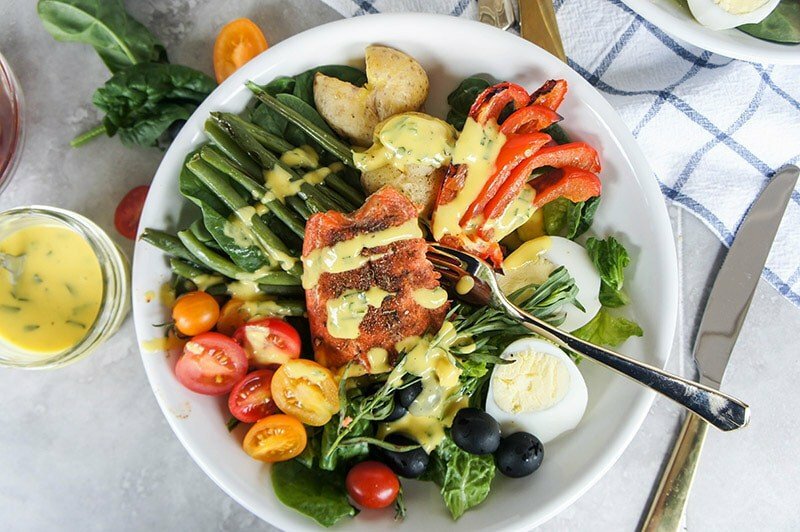 This Blackened Salmon Nicoise Salad with Mango Tarragon Dressing is a dressed up and super flavorful version of a classic! Salmon gets a spicy coating of blackening seasoning, and then then the salad is covered in a luxuriously sweet and creamy mango-tarragon dressing. Healthy can be flavorful! Fall is my favorite season. A season I haven’t seen in 7 years, and one of the reasons I so urgently wanted to move back to America! I love the chilly mornings, frost on the trees, steamy mugs of tea and cookies on chilly afternoons. An excuse to bundle up and walk my favorite trails — fall leaves! It’s also the beginning of such an exciting season. After back-to-school, there’s Halloween, Thanksgiving, Christmas . . . and then . . . just cold, and the excitement over the chilly weather is over, right?! Growing up in Bend, Oregon, January is when winter started feeling long, when all the festivities were over but the weather stayed prohibitively cold. And yet, after living in the tropics and 90 degree weather year round, I am so looking forward to living here again. Fall also means giant pans of roasted vegetables. Throw some salmon on that pan and call it dinner (the photo above with the veggies and salmon is seriously one of the easiest, most healthy, and most delicious dinners- it’s our “go-to” during busy work weeks). 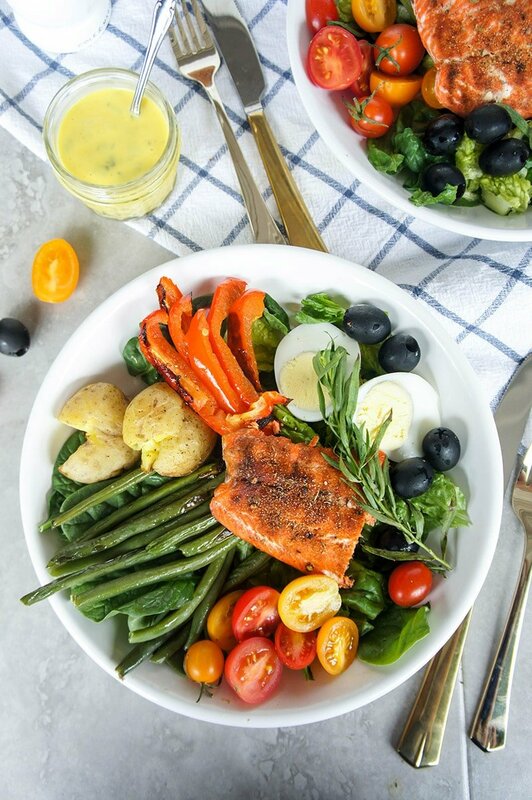 This Blackened Salmon Nicoise takes it a step further and layers those roasted veggies on a bed of greens with a few extra adornments, and then is drizzled in the most luxurious sweet and tangy mango tarragon dressing. Still has that classic French flair, but with an updated and super delicious twist. The Blackening Seasoning is one I have been using for years– I posted it way back when I first started blogging on my Blackened Salmon and Mango Salad and my Blackened Salmon Tacos with Mango (apparently this seasoning always has me thinking MANGO!). This seasoning is fantastic on salmon, but I also use it on chicken. In fact, blackened chicken and my Balsamic Chicken are the two most common ways I prepare chicken. Easy, but tons of flavor! Meal Prep it: Do you Sunday meal prep? I did when I was working full time. Having washed and chopped veggies and pre cooked proteins is the best way to ensure the best nutrition when things get hectic. You can have this salad, or variations of it all week. Make the dressing and the seasoning blend to have on hand. I love having boiled eggs and grilled chicken, so making both of those to have in the fridge is great too. Another one of my favorite eat-healthy all week strategies is to have a large bag or two of veggies to roast. Then, when I come home tired, all I have to do is dump them out on a roasting pan toss with olive oil, and toss in the oven. Make it Vegetarian: Omit the salmon, and double up on the hard boiled eggs. 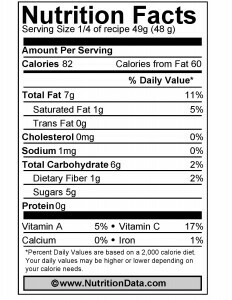 I have a soy allergy, but if you eat it and want something to coat in the blackening seasoning, try sauteeing some blackened tofu. For the Family: Xander has been a great eater for us and loves his vegetables, but salad is lost on most kids. However, this is his favorite way to eat potatoes. When we have this meal, he gets a plate with the potatoes, olives, roasted veggies and salmon. Older children would love to use the dressing as a sweet dipping sauce, too! This hearty and healthy salad is a fantastic lunch or dinner. Most of the ingredients can be prepped ahead, saving time, and making it a perfect option for weekly meal prepping. I love to have these ingredients pre-cooked in my fridge for quick lunches during the week. 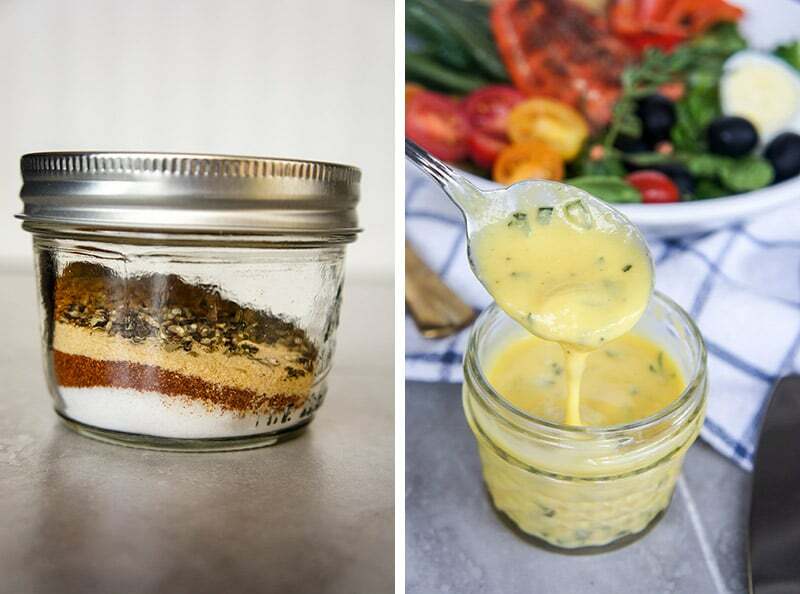 The Mango Tarragon Vinaigrette is a must-try! 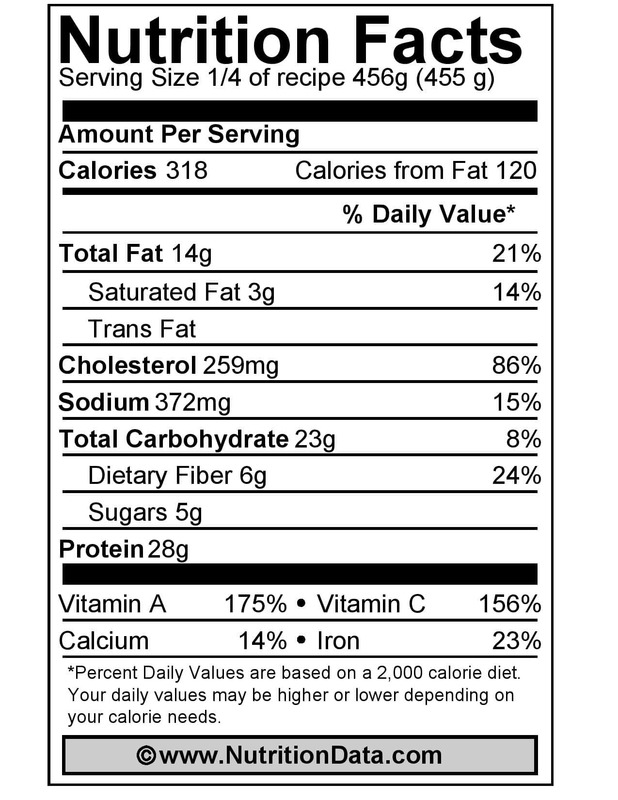 The blackening seasoning is wonderful on salmon, but you can also use it on chicken, pork, or other types of seafood. The most time consuming part of this recipe is having the cocktail potatoes and eggs boiled ahead of time. If this step is done ahead of time, the rest of the recipe is rather quick to put together. Add the baby potatoes to a pot of boiling water. Boil for 15-20 minutes, until potatoes are easily pierced with a fork. Hard boil eggs (my method is to add eggs to a pan with cool water, and bring to a boil in high heat. Once the water is boiling, I reduce the heat to low, and cover the pan with a lid. Simmer the eggs on low heat for 10 minutes, then remove from heat, drain the hot water, and cover the eggs with cold water to cool). Prepare the spice rub (if you like a very spicy blend, reduce salt to 1 1/2 tablespoons, and use more spice rub). The recipe I link to above is for about 1/3 cup of spice blend, but you will only need 2 teaspoons for this recipe. Use leftover spice rub on whitefish, shrimp, pork or chicken. On a cookie sheet, lay out the salmon fillets, green beans, red bell peppers, and baby potatoes. Add 1/2 teaspoon of honey to each salmon filet, and rub it in a thin layer, followed by 1/4-1/2 teaspoon of blackening spices. Drizzle olive oil over the green beans, peppers, and potatoes. Season with sea salt and black pepper. Gently smash the baby potatoes against the pan. 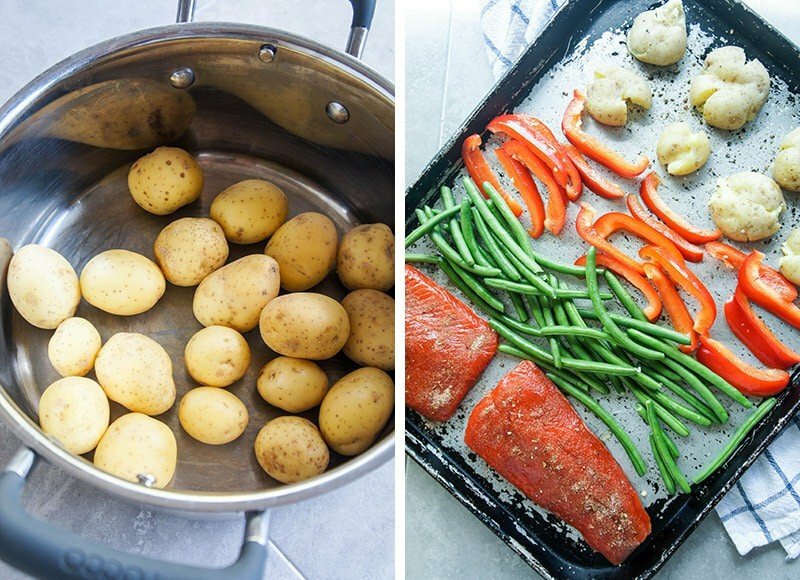 Bake the salmon and vegetables for 20 minutes, until salmon is baked through. Prepare salad dressing by adding all ingredients except the tarragon to a blender, and blending until super creamy. Chop tarragon roughly. Add the tarragon to the blender, and pulse 3-4 times to combine. On plates, layer romaine lettuce and spinach, and top with cherry tomatoes, olives, and cooled hard boiled eggs. Once the salmon and veggies are roasted, add a salmon fillet and roasted veggies to each salad. Serve with mango tarragon vinaigrette. *Homemade blackening seasoning is easy to make, and easy to adjust to your tastes. The original recipe is heavy on the salt, meaning you use just a small amount of the rub. If you prefer your seasoning extra spicy, lighten up on the salt and use more of the rub. The recipe makes approximately 1/3 cup, meaning you'll have plenty leftover for other dinners! Dahn, it is amazing! I was unsure of adding mango to a salad with olives and potatoes and tarragon-- but I knew I needed to try it, and it exceeding my expectations! The dressing on it's own is a bit tart, but blended with the flavors of the salad it's absolutely perfect. Me & my hubby, love salmon a lot. This looks like a great recipe to try. Pinning it as well. Thanks Aish! We love salmon, too. It's so easy to prepare for quick dinners, too! Hold the phone. That dressing sounds amazing!!!! Hi Kate! The dressing is fabulous-- really makes this salad special!